Light flyweight Zou Shiming (1-0) got his career off to a good start with a four round unanimous decision on Saturday night in beating Valenzuela (2-2-1, 1 KO’s) by a four unanimous decision in a fight that was pretty much one-sided from start to finish at the Cotai Arena, Macao, Macao S.A.R., China. 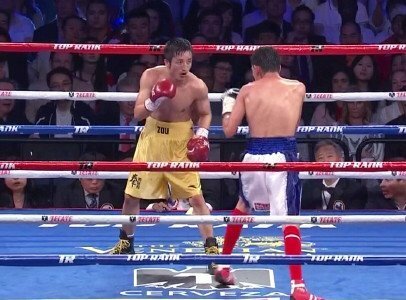 Shiming used his jab and fast hands to land at will against the more limited Valenzuela. Zou had Valenzuela hurt from a left hand in the 2nd, but he didn’t have the power to add to it. The judges scored the fight 40-36, 40-36 and 40-36. Valenzuela was getting to Shiming in the 3rd round and it wasn’t impressive stuff by Shiming despite the fact that he was still landing more. Valenzuela wasn’t bothered by his shots for the most part other than that one left hand he was clipped with in the 2nd. Shiming’s trainer Freddie Roach believes that Shiming will be ready to capture a world title by next year, but after watching Shiming fight tonight I can’t see him beating anyone good unless they do a good job of scouting out an easy mark champion. Shiming certainly isn’t going to beat WBA light flyweight champion Roman Gonzalez. I think Gonzalez would knock Shiming out and be way too strong for him, and I have a feeling some of the other champions would be too strong for him as well. He’s too weak for this division and he may need to think about moving down to minimumweight where his lack of power won’t be such a problem for him. WBA and WBO flyweight champion Brian Viloria (32-4, 19 KO’s) lost his titles tonight in a 12 round split decision loss to #14 WBA challenger Juan Francisco Estrada (23-2, 17 KO’s). The final judges’ scores were 116-111 and 117-111 for Estrada and 115-113 for Viloria. It just seemed like Viloria, 32, couldn’t handle the pressure, work rate of the younger 22-year-old Estrada. The younger fighter just kept coming forward in each round nailing Viloria with uppercuts, hooks and shots to the body. In the 12th round, Estrada had Viloria hurt with a minute to go in the fight and he really pounded him until the fight ended. Viloria was cut on the left side of his eye and his face was badly swollen up. This was a bad match-up for the 32-year-old Viloria and perhaps he didn’t realize how good Estrada was given his low ranking by the WBA. Diego Magdaleno (23-1, 9 KO’s) was outworked by WBO super featherweight champion Roman Martinez (27-1-2, 16 KO’s) with Martinez winning by a 12 round split decision by the scores 115-112 and 114-113 for Martinez, and 116-111 for Magdalena. Martinez knocked Magdalena down in the 4th with a right to the head and continued to trouble him the entire fight with shots to the head and body. Magdalena wasn’t able to work hard enough to be competitive with Martinez, and in the last part of the fight he just looked tired and was only able to muster up enough offense to land an occasional big shot. It was a really disappointing performance by Magdalena given all the hype about him. He didn’t lose special at all tonight and he clearly was the loser. Former WBO super bantamweight champion Wilfredo Vazquez Jr. (22-3-1, 19 KO’s) was beaten by Yasutaka Ishimoto (22-6, 5 KO’s) by a 10 round unanimous decision by the scores 96-95, 96-93 and 95-94. It was a close fight that could have gone either way. Ishimoto scored scored a knockdown in the 8th and that was the difference in the fight.